If it seemed a little quiet on the blog this weekend, it’s because I was away for a two-day workshop put on by the local weaving guild. The best part about being in the guild (and any craft circle in general) is that we get to see what other people are doing. This workshop was especially fun because it was a round robin. Everyone was given a set of instructions ahead of time, and we all brought looms that were already set up and ready to weave. 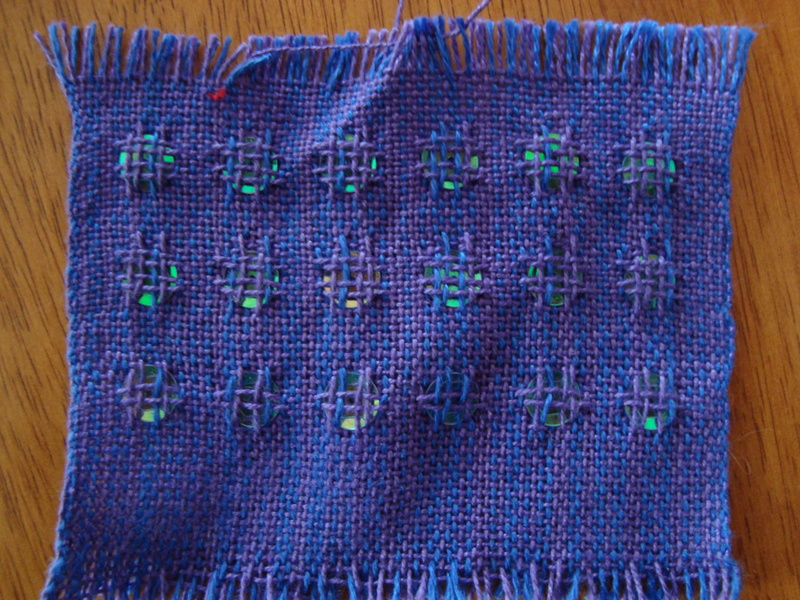 During the workshop, we switched back and forth between looms, weaving a sample on as many as we could get through (I only missed one that I wanted to try, so the timing was also perfect). All of the projects were based on a single woven structure, called double weave. 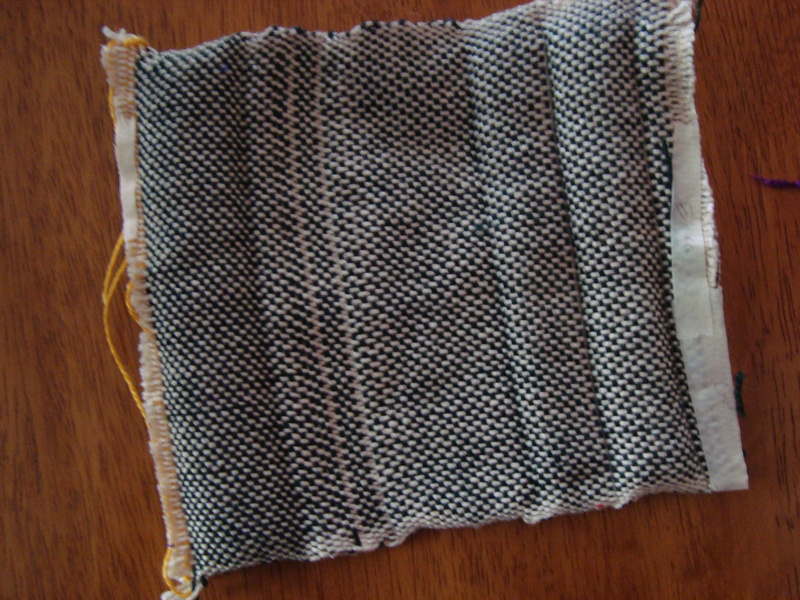 Like with double knitting, you’re basically just working two layers of fabric at the same time, except in weaving they don’t necessarily have to be connected into one piece of cloth. 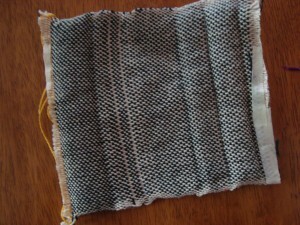 I was familiar with the idea of this technique only as a way of weaving cloth twice as wide as your loom (you weave two layers that are connected along just one side, and then open it up when you take it off the loom). 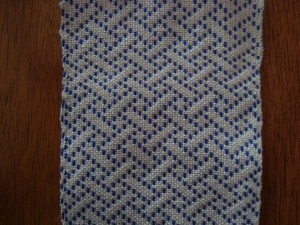 As you can see from the samples below, there are many, many more things to do with double weave than to make wide fabric. 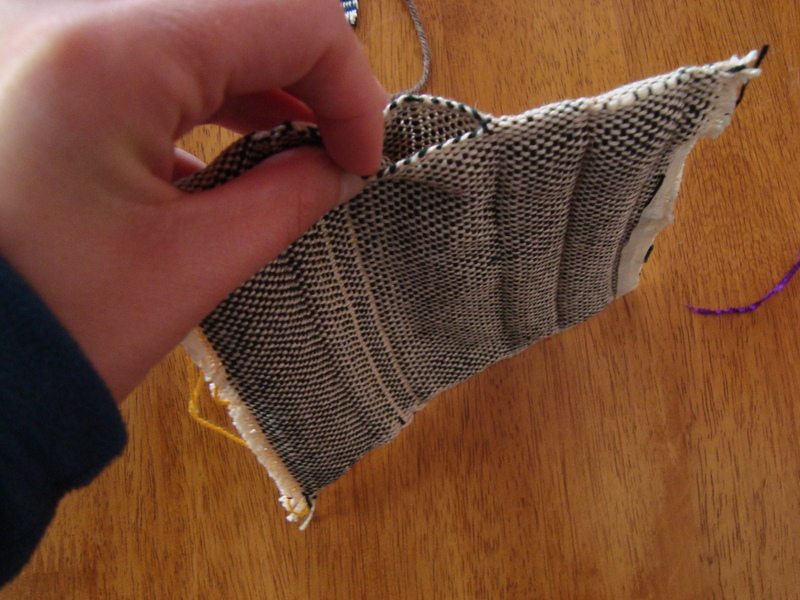 And if you go back and forth between tubes and double-wide fabric, you can have a pocket that opens on the side. Instead of pockets, you can have blocks of color that switch back and forth. Or, you can use a looser cloth and weave things right into the fabric. Those are little sequins added in before sealing the pockets up. You can’t really see here, but they do sparkle quite a bit. 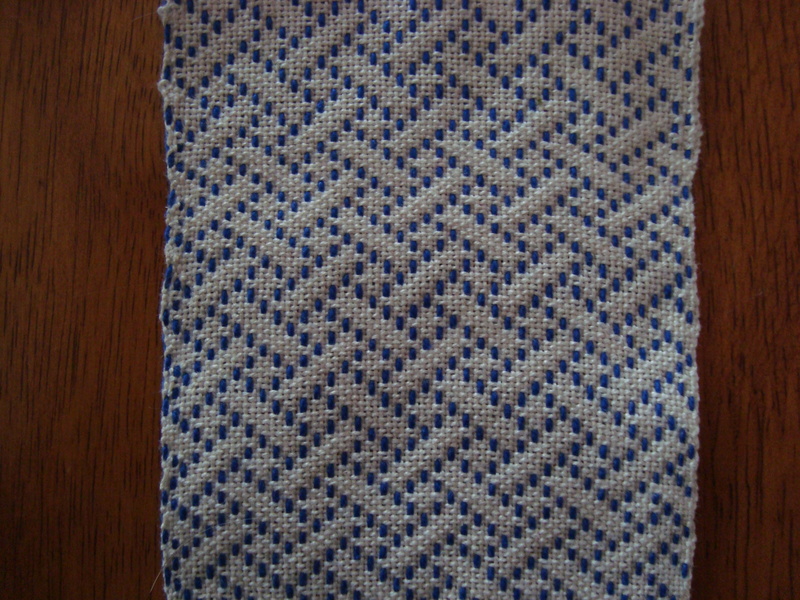 This isn’t something I would have woven for myself, but it was fun to try. There has to be some use for it…maybe buttons rather than sequins? If you’re willing to get a little more complicated (and have the loom to do it), then the blocks don’t have to be plain anymore. 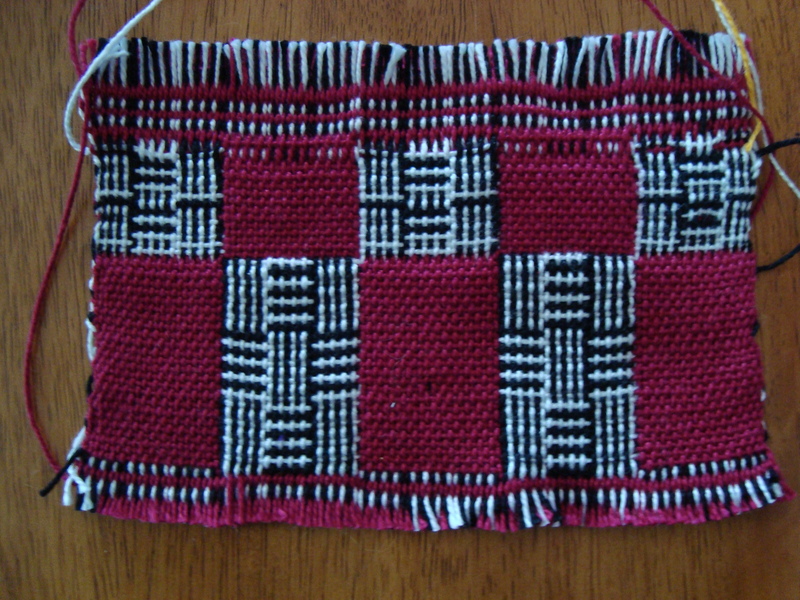 The other side of this fabric is perfectly reversed, and it’s all made up of blocks that are black and white on one side and red on the other. Unfortunately, I ran out of time on this one, but you get the idea. You can also do amazing things with color. If you don’t want blocks, you can always have the layers switch back and forth in a different sequence. This piece looks the same on the back, except that the blocks are blue and the lines are white. 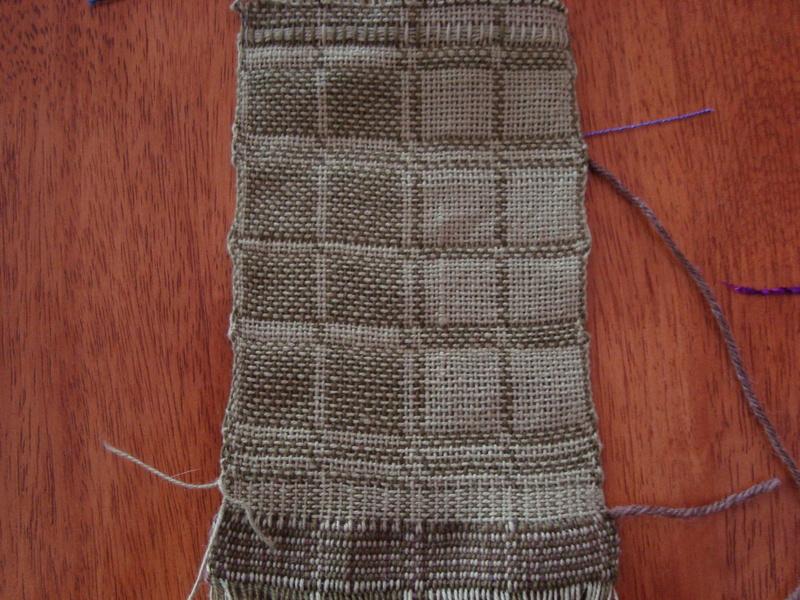 And then again, you don’t have to weave the second layer at all. 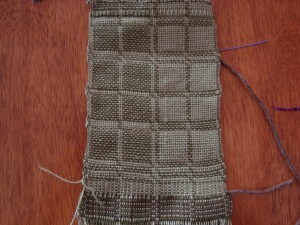 This leno lace is made by weaving one layer (the background color), and letting the other have really long floats. Then you go back and twist the floats around one another to get an hourglass shape. Lots of things to play with here! 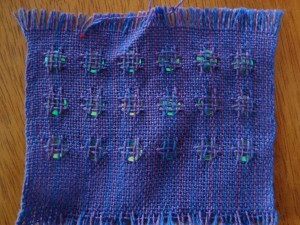 This has only scratched the surface of what’s possible, and I can definitely see myself using double weave for some future project. Not a bad way to spend a weekend! Oh those are all so neat! 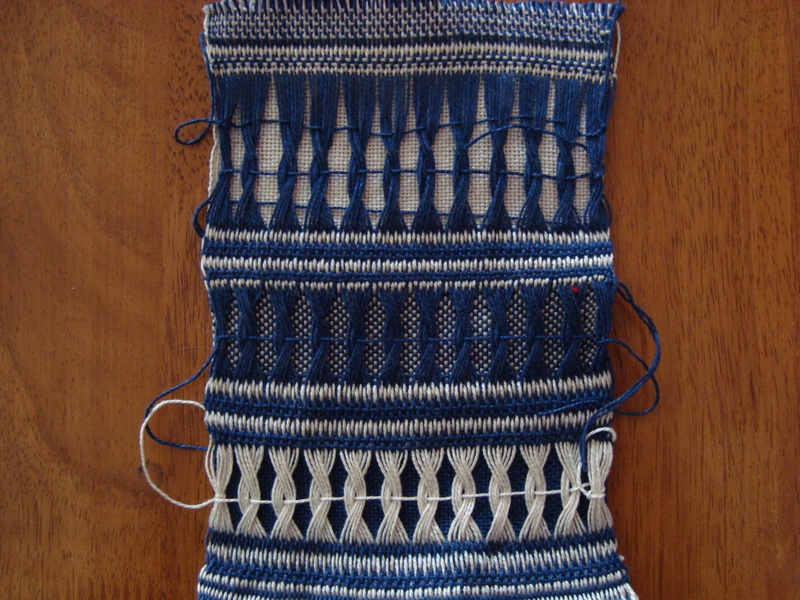 I’m really fascinated by weaving–wondering how all those various patterns are made–but it’s not something I can really explore right now. Silly space issues…. Very cool and very interesting how same techniques but so many possibilities. Very nifty! Envious of your workshop! That’s really cool! 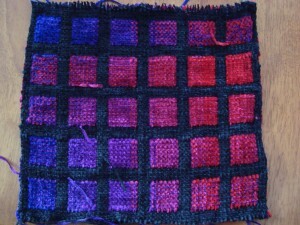 I love the squares of color! Oh, wow. There are some lovely pieces there! (I particularly like that blue and white one, second-to-last, for some reason.) What a really great workshop – it sounds like the organizers did a great job of setting things up, and it’s a wonderful way to try a lot of new things all at once. 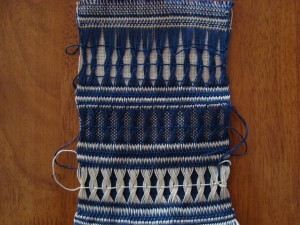 The blue and white one that Jocelyn likes reminds me of Japanese sashiki embroidery. there could be a wealth of design ideas in that! And yes, a very good way to spend a weekend. Sounds like a great workshop! The illustrations and your commentary help so much. 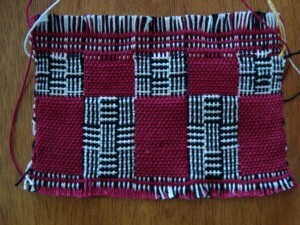 Makes me consider taking out my loom from storage (it’s just a table loom). 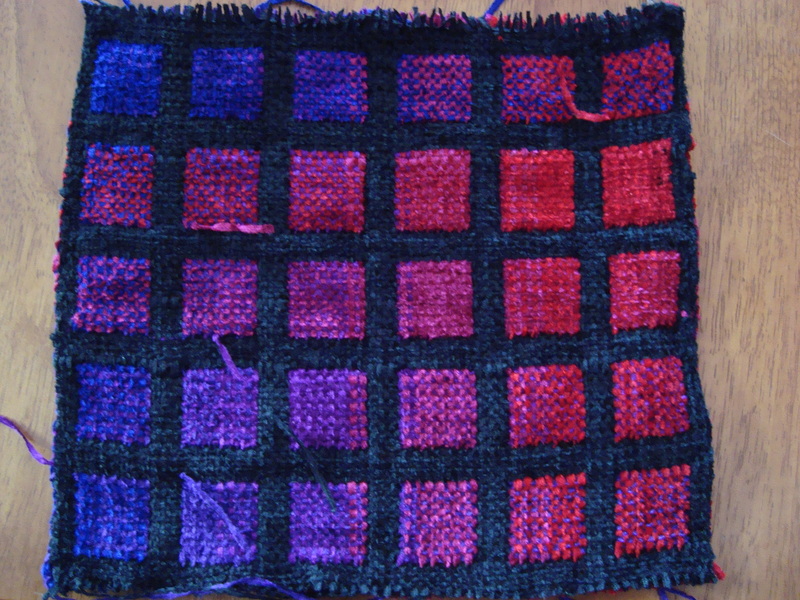 I found a few of my double-weave samples online (you will recognize which ones are double weave, but I really need to add better descriptions). DesigKnit is powered by	WordPress 4.8.9 . Page generated in 0.324 seconds using 35 queries.